Open year around, check in 4-9 pm, check out by 11 am. No early check ins or late check outs. An adults only eco-friendly "green" bed & breakfast featuring a passive solar main inn & unique yurt lodging. Located 6 miles north of the historic Dahlonega square & minutes away from four local wineries, nearby waterfalls, biking routes and hiking trails. Closest inn to Wolf Mountain Winery. Not your traditional b & b, the inn is popular among guests who enjoy the outdoors and organic breakfasts. Property features many varieties of fruits/edible plants, organic veggie garden, extensive water catchment swales and other permaculture elements. Choose between charming rooms in the passive solar designed inn or unique yurts (tent like structures) in the woods. Visit our web site for more information or view pictures and video on this page. BREAKFAST- Delicious breakfast using organic ingredients always served, vegan or gluten free advance notice. 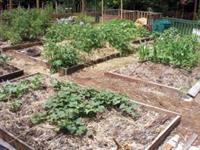 Onsite permaculture veggie/herb garden provides seasonal ingredients. Organic pasture raised eggs used, organic ingredients used. Click CHECK VACANCY to visit the availability calendar, check rates and make reservation requests online & check for current rates. RESERVATIONS REQUIRED with at least 24 hours. DROP INS not accommodated. Notes: Click "Check Vacancy" for current rates. Detailed directions only provided to guests with reservations in order to assure privacy and a restful atmosphere for our overnight reserved guests, permaculture students and ourselves. No drop ins.